Whether your network is a complex carrier or just a few machines supporting a small enterprise, JUNOS High Availability will help you build reliable and resilient networks that include Juniper Networks devices. With this book's valuable advice on software upgrades, scalability, remote network monitoring and management, high-availability protocols such as VRRP, and more, you'll have your network uptime at the five, six, or even seven nines -- or 99.99999% of the time. Rather than focus on "greenfield" designs, the authors explain how to intelligently modify multi-vendor networks. You'll learn to adapt new devices to existing protocols and platforms, and deploy continuous systems even when reporting scheduled downtime. 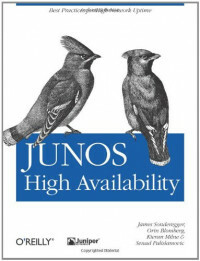 JUNOS High Availability will help you save time and money. This book is a core part of the Juniper Networks Technical Library™. Unless you manage a hook-and-ladder company, your workday shouldn't be spent putting out fires. Yet leaders often spend most of their time running from crisis to crisis.